Benjamin Domenech is Editor in Chief of the New Ledger. A friend asked today if I was proud to have "one of your own" on the Supreme Court. In the larger sense, I share Republican Gov. Luis Fortuno's sentiments: having a Latino legal scholar on the highest court is a good thing for the country, and having a Puerto Rican who experienced adversity adds some small amount of personal pride. Yet it is a particularly fleeting form of pride at best, the sort you get when your hometown team wins a pennant in a sport you don't follow. Personally, I would have preferred Obama's check the box for the first Latino justice (assuming we're all agreeing Benjamin Cardozo doesn't count for diversity purposes) be Secretary of the Interior Ken Salazar - but Sonia Sotomayor represents a nominee who is, on paper at least, qualified for the position. There is no doubt she will be confirmed by the Senate. And I believe, despite her clear reputation for liberalism and advocacy from the bench, my friends on the center-right should be happy that she is President Obama's choice. Given an early opportunity to remake the Court in his image, Obama has once again passed on the wishes of his more leftward supporters - who certainly gave as many signals as possible that they preferred Diane Wood or Elena Kagan - instead choosing to nod toward racial and ethnic political considerations. Some Hispanic leaders had expressed disappointment with the makeup of the cabinet after Bill Richardson's withdrawal - and with David Souter's retirement, this unexpected opportunity to play this game was too good for Obama to pass up. He's very good at it. Being a nominee to the Court these days puts you in the crosshairs of everyone and his Twitter followers, right and left, poring over the records of everything you've ever said, particularly speeches on hot button issues containing comments on how "wise Latinas" will by default reach better legal conclusions than a "white male" with his limited personal experience. The fact that Sonia Sotomayor is a Latina should not give Repubilcan senators any political pause or hesitation from giving her the scrutiny that all nominees deserve. There is no larger demographic group in America today that could better understand what it means to have courts and judges who favor one side over another, without an argument ever being made, than do Hispanics. It is among the reasons why we came here. This nomination offers a great opportunity to explain to Hispanic Americans why the Constitution must be defended against judges who would rewrite it according to personal politics and biases. Some on the left are deploying the record of Republican "Aye" votes for Sotomayor at her initial nomination to the Second Circuit, but they should remember that she was originally part of a deal with Daniel Patrick Moynihan, and votes at the time aren't particularly representative. After all, Sotomayor has an 11-year record on the appellate bench since then, and it would be silly to suggest that Senators should ignore that record. And past confirmations did nothing to help Robert Bork, who was confirmed as Solicitor General and as a Circuit Judge by the full Senate. And in the unlikely event that Senate Republicans do put up a fight, it is a sign that they have accepted President Obama's highly politicized view of the judiciary. Obama, who voted against both Roberts and Alito (in fact, he was one of only 25 Senators to vote in favor of filibustering Alito and one of just 22 to vote against Roberts), set a distinct precedent by voting against men he publicly acknowledged as "clearly qualified" for their positions on the Court - opposing them for purely political reasons. This is not how it always was. The tradition of Senatorial deference to the executive branch was a powerful one, and died slowly: as recently as 1991, Clarence Thomas was confirmed by a 52-48 margin despite the Democrats holding a 57 seat majority, just two fewer than they do today. It is impossible to imagine such a circumstance today, and Thomas was certainly more controversial as a nominee at the time than Sotomayor could ever become (barring a hearing meltdown or some other unforeseen event - one assumes the Administration made sure she has paid her taxes). Thomas has since proven not only eminently qualified but intellectually distinctive as a Justice, and only the most extreme partisans would say he was not fit for the court on the merits - but a similar scandal, even a manufactured one, would be enough to derail a nominee not favored by the majority party. Of course, now that they are the majority party, the Democrats who were prepared to put Roberts and Alito through similar paces and were frustrated in their efforts are prematurely criticizing Republicans for adopting their tactics of the past eight years. Dahlia Lithwick is one of the observers on the left who wants to put the horse back in the barn - but she is laughably late, and apparently unaware that the internet remembers what you wrote under a different administration. They shouldn't have anything to worry about from the right. Besides Senators Sessions and Coburn, it's doubtful any of the members of the Judiciary Committee will do more than ruffle Sotomayor's feathers. While it may be true that Sotomayor was the candidate on Obama's short list most likely to inspire conservative opposition, the criticisms they have of Sotomayor come down to concerns over her decisions and her reputation for being an oft-overruled liberal. These complaints are the sort to rile up any Federalist Society member, but they simply are not transferable to any sort of public uproar, even including the likely overturning of her ruling on racial preferences and firefighters - it should be a minor embarassment, but one that would only matter if the margin in the Senate were reversed. If anything, the first priority for the White House should be for reassuring a few of their most outspoken allies on the left, who already are expressing worry that as a Latino Catholic, Sotomayor could be a less than eager defender of Roe v. Wade. This is worth noting: given the chance to select Diane Wood, a brilliant legal voice and a hardened defender of unrestricted abortion rights, Obama went for the personal story that would appeal to the media instead, disappointing once again some of his supporters. But these groups should be expected to fall in line - Sotomayor gives no signs of being a stealth nominee for the pro-life cause. This is what it all comes down to, in fact. 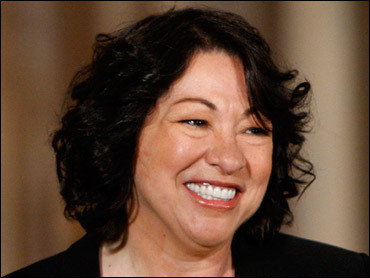 As John Yoo notes, Sotomayor gives no signs of being a threat or an asset to any particular cause. It's unlikely that she'll be further left than the man she's replacing, and if she has the gift for motivating or shifting her fellow justices, she hasn't displayed it on the Second Circuit, where no one regards her as a leader. She is, in other words, unlikely to shift the Supreme Court in any direction, to any significant degree, from where it was before her arrival. So is Judge Sotomayor a liberal? Yes. On paper, does her resume make her qualified? Despite questions about her decisions, yes (certainly more so than Harriet Miers). Will she vote as Souter did on Roe and other divisive social issues, her vaunted empathy extending only to those people who happen to be walking around? Almost assuredly. Should constitutional originalists, textualists, and strict constructionists approve of this nominee? Of course not. But on balance, is she the least troublesome choice for the Supreme Court that those on the center-right could reasonably expect from this president - who, for all his moderate policies in other areas, is unreserved about being on the far left of the legal community - and embodies a Lifetime movie fulfillment of said judicial philosophy? I believe the answer is, emphatically, yes.